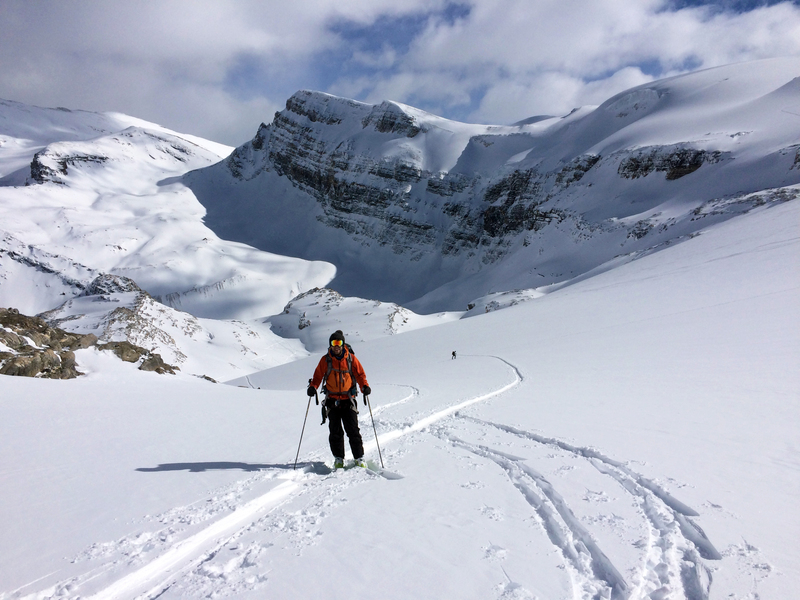 It was March 2016, and after a disappointing start to the season in the Alps I was excited to be heading to the Canadian Rockies in search of the champagne powder that had eluded me on previous jaunts to this side of the Atlantic. It was my first season back after recovering from an ACL reconstruction, and after a couple of short trips in the Alps, I wanted to test my knee on something bigger. 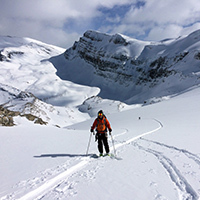 A friend and I booked onto a ‘Intro to Ski Mountaineering’ course with Yamnuska based in Canmore, Alberta. 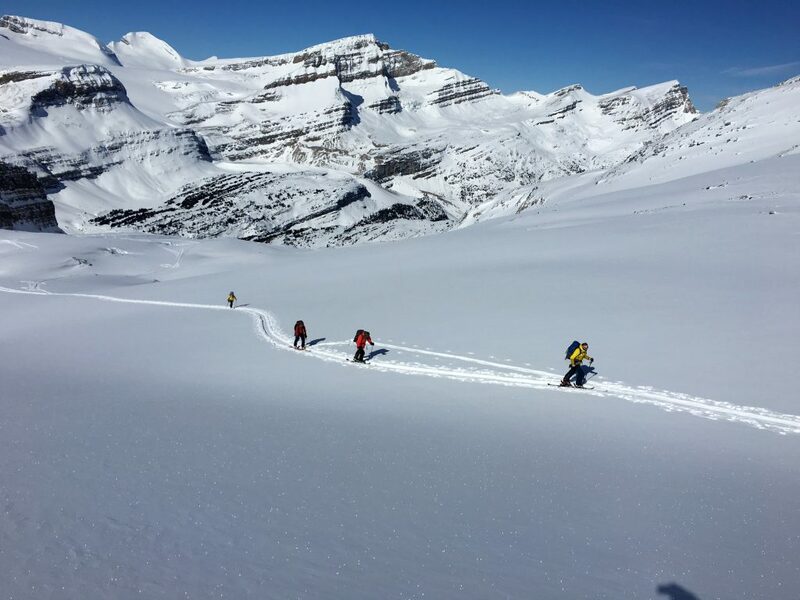 Although the course would teach us some of the basics such as transceiver training and avalanche awareness, (something which we’d both done before), it would also teach glacier travel, crevasse rescue and track setting, something we were both keen to learn more of. Perhaps the biggest attraction though was its location in the Wapta Icefields inside Banff National Park. 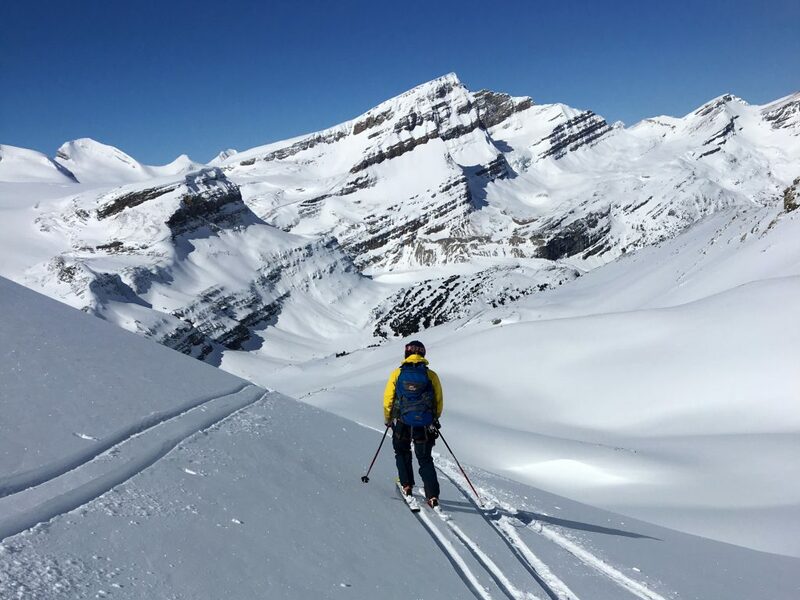 A vast area of remote backcountry away from the resorts with snow-sure peaks and stunning glaciers – quite simply a paradise for ski tourers. A series of basic mountain huts provides the basis for a popular tour covering much of the ice-fields. We were basing ourselves in Bow Hut, the biggest (and comfiest) of these and venturing out for day trips in the surrounding peaks. We arrived at Bow Lake after a 1.5hr drive from Canmore. We were a group of 6 – a young local Canadian couple, an older (late 40’s) American guy from California, ourselves and a local guide named Shaun. We left the parking area and first crossed the frozen Bow Lake. The ascent then winds up through forest before reaching a canyon aptly known as the Mousetrap. Trying to reduce our exposure in the avalanche prone slopes surrounding us, we navigated our way through the boulder strewn canyon as quickly as possible. Once passed, we traversed around a bowl into a huge amphitheatre with a shear overhanging rockface with glacial ice and cornices above. It’s a stunning sight, but also a little unnerving knowing that a cornice could drop at any point. 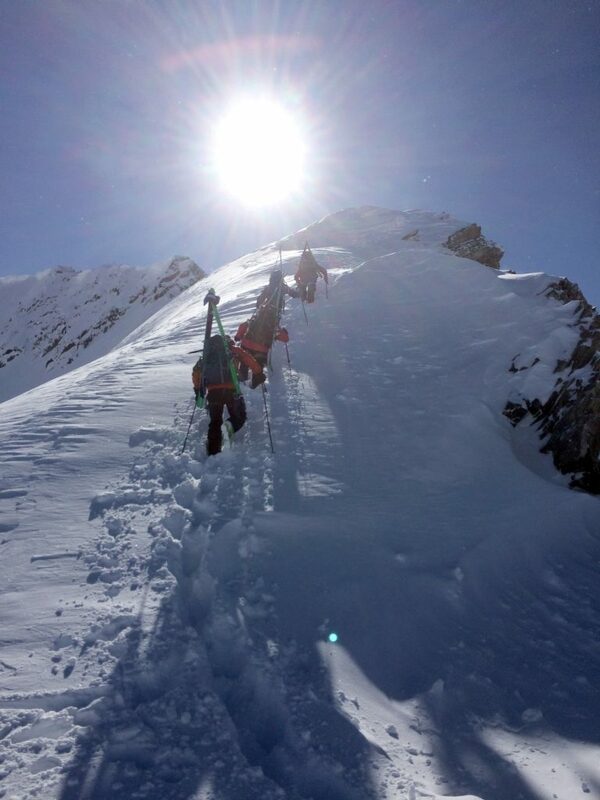 We passed underneath as quickly as possible before starting the steep final ascent to the hut. We reached the hut by late afternoon, held up somewhat by the unprepared American in our group. 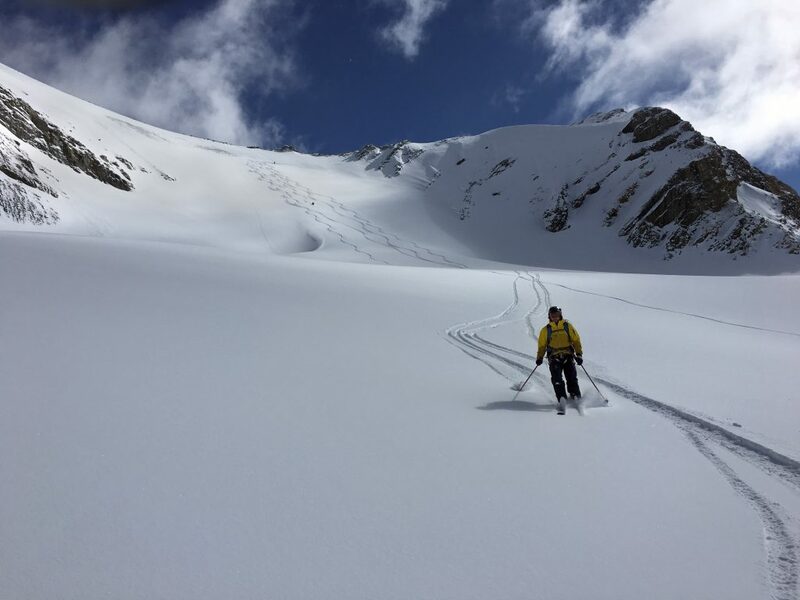 He’d clearly over-stated the relevant ski touring experience he’d had, battling with simple switchbacks and changing the climbing aids on his skis. 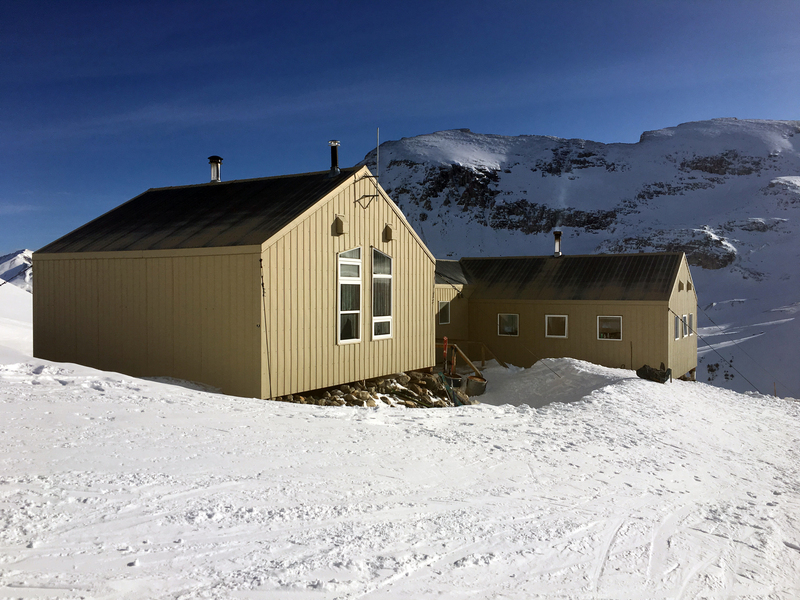 Bow hut is nestled on a bench beneath the Wapta icefield at around 2400m. With views of the Vulture Glacier to the south and Bow Lake to the north, it’s a stunning location. The corrugated metal hut consisted of a sleeping area accommodating 30 people in bunk beds, a living area centered around a wood stove, a kitchen area complete with sinks, cooking utensils and supplied propane stoves. No electricity meant water had to be melted from the snow in pots on the fire or the stoves. A connected outhouse provided two toilets. With no mobile phone service, it’s the perfect place to spend a few days in complete solitude, shut off from the outside world. The deal with the guide was that each evening, two of the group would prepare the food, whilst another two would clean and pot-wash, rotating every day. Straight away it felt kind of cub-scoutish – with the guide berating us on the schedule we had to keep and hassling us to complete our chores promptly after dinner. Food mostly consisted of dehydrated meals packaged by Yamnuska which were surprisingly tasty and very filling (think standard North American portions). The following day was spent practising skills in safe areas not far from the hut to ensure everyone was familiar with their equipment, rehearsed in search and rescue techniques and touched upon crevasse rescue techniques to prepare us for the surrounding glaciers. In the afternoon we had a short ski beneath the hut to freshen our legs, before touring back up for some dinner. The forecast the following day was for low cloud cover and poor visibility so we made a plan to climb Mt Rhondda, a 3015m peak with a fairly straight forward ridge line towards the summit. The next day after breakfast we set off towards the Onion, a ringed flat peak behind the hut, roping together as we climbed up the glacier which formed the edge of the vast Wapta Icefield. Fortunately for us, the guide had instructed the slow American to stay at the hut. 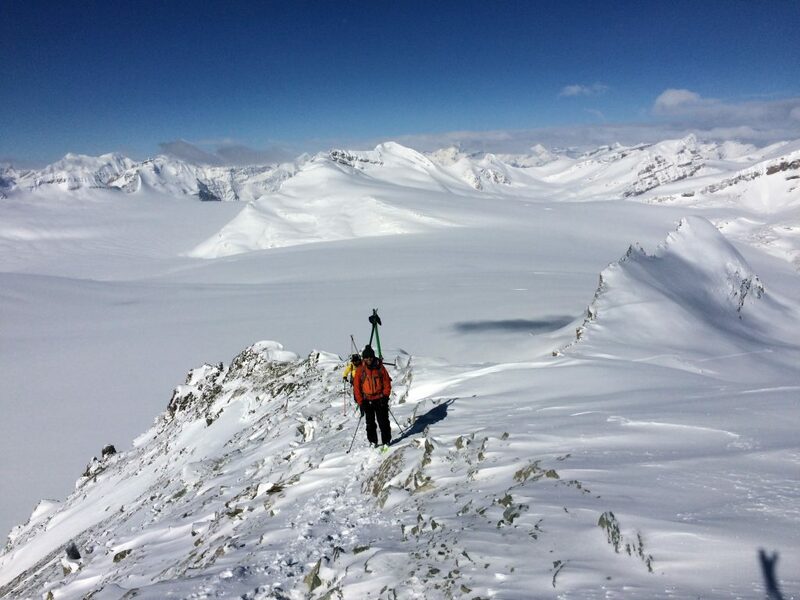 His level of experience in both touring and skiing wasn’t enough for the terrain we would ski. He would undoubtedly slow the group down which in avalanche terrain is a huge concern. After cresting the ridge line that went up to the Onion summit, instead of continuing to the summit, we headed West towards Rhondda crossing the icefield and basking in the amazing 360° views surrounding us. After a couple of hours we arrived at the Rhondda ridge now covered in a layer of thick cloud. With poor visibility it was a good lesson on how to navigate in such conditions, using a compass, map and estimating distances based on how many steps you take. We followed the ridge line descending and ascending over several rolls before reaching the summit early afternoon in whiteout conditions. With temperatures at -14C we didn’t hang around long before making our descent. The ski down was good with a layer of fresh snow, although we had to wait for the weather to clear slightly before we could actually see what we were skiing. Back at the hut, plans were made to climb Mount Olive the following day. At a height of 3130m it’s a more technical challenge than Rhondda, with rock and steeper ridge lines to contend with, but certainly something we all felt ready for after the previous days learnings. There’s actually two peaks on Olive, a North and a South, with the South being the true summit – so that was the target. The weather was forecast for clear skies and low temperatures. We set off early the next day and made our way up to the col between St Nicholas and Mount Olive. 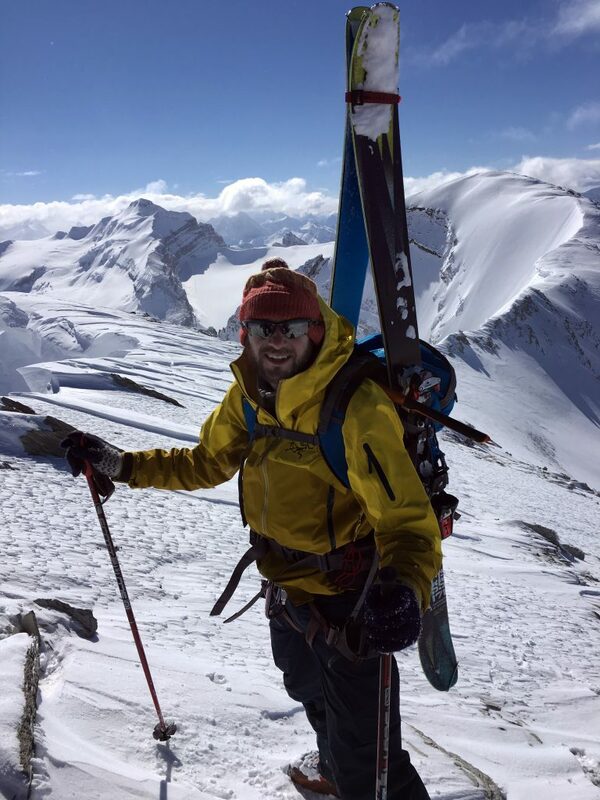 After digging a snow pit to confirm the snow stability was suitable, we continued up the ridge line to Mount Olive North, demounting our skis to climb along the rocky spine. The views were breathtaking. To our right, a sheer drop down 100m or more to the glacier provided views of the Wappta and Waputik icefields. Ahead of us, the ridge climbed steeply to a rocky outcrop. We waded through 2ft deep snow using our ice axes to give us extra support, before gingerly rounding a rocky pinnacle where a slight slip would undoubtedly prove fatal. A short gradual climb led up to the North summit providing views to the South summit and beyond. We took a few summit pictures before decending the ridge line to the North/South col.
Our guide decided that the ridge up to the South summit was too exposed and not worth the risk, and besides the best ski descent would be to the West from the col. We transitioned to our skis and readied ourselves for the descent. An untouched slope of around 35° lay before us. The top section was very wind affected making turning difficult but beyond that lay 300m of pristine powder which was an absolute joy. Approaching the bottom of the slope and the start of the glacier, a small bridge in the middle of a bergschrund provided the obvious route to cross safely. 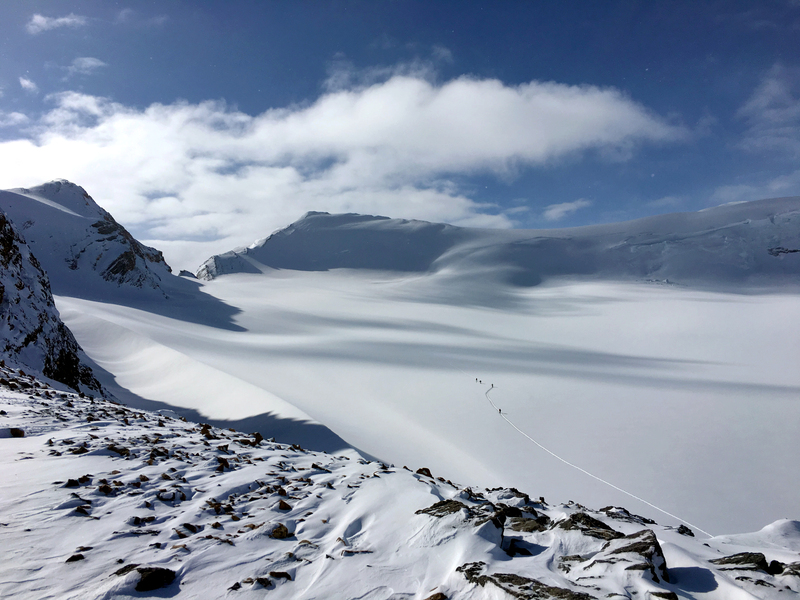 We then skied the flat glacier roped together back towards the base of St Nicholas, before descending the last slope above Bow Hut. The next day we had our sights set on Little Crowfoot. A smaller mountain at 2800m, it’s remarkable for it’s ski descents and spectacular views, rather than any difficult technical climbing needed to ascend it. Throughout the week we’d taken turns to lead the up-tracks receiving feedback from the guide about our route selection. I’d chosen to take the lead for the morning route and with good visibility and clear skies was excited to get going. After a short ski down beneath the Vulture peak we began the ascent, winding our way up through the tree-line and onto the moraines beneath Crowfoot. The ascent was gradual and so navigating this terrain was quite straight-forward – the challenge came when we approached the glacier. Due to a fair amount of convexities in the slopes, the chance of crevasses was higher than on the previous glaciers we’d been on. We hadn’t roped together on this glacier because of the good snow cover and visibility, so it was my responsibility to avoid any potential crevasses. Following tracks from previous parties, I skirted around the convexities as much as possible, keeping to the higher ground wherever we could and ensuring our group was well spaced out just in case one of us should fall in a crevasse. The guide seemed generally satisfied with the route selection, but he did have a couple of digs at my pace setting, stating that I was going too fast for the group, so I tried to slow the pace down a bit. 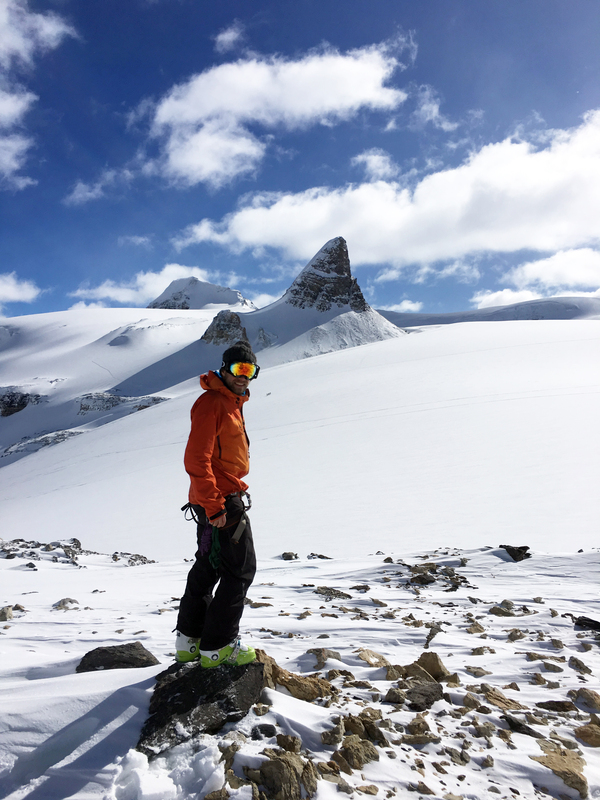 After a couple of hours of climbing, we arrived at the summit of Little Crowfoot with sublime views to the South of Mount Balfour and Mount Temple in the distance and North over the way we came and further to Bow Lake on the valley floor. The ski down made the mornings efforts well worth it. We first headed North East from the summit, taking a similar line to the route up, and in particular a steep section we’d been eyeing up enroute to the summit. The conditions were perfect. The powder still cold enough to be light underfoot, we skied down in absolute joy until we hit a flattish section at the foot of the glacier. With time on our side, we decided to skin back up to the summit and this time take a Westerly route down passing beneath Vulture peak and into the bowl beneath Bow hut. The next day was our last and after cleaning the hut and packing our bags, we set off for Bow Lake and back to civilisation and a eventually a shower! The ski down was fun although the biggest challenge was helping the American to get down in one piece. His skiing level was on a par with his overstated touring experience. The tight switchbacks through the trees with a heavy backpack on the final descent proved to be quite troublesome, although everyone else seem to enjoy it. Fortunately we all arrived back safely at Bow Lake, and loaded up the van before heading back to Canmore. 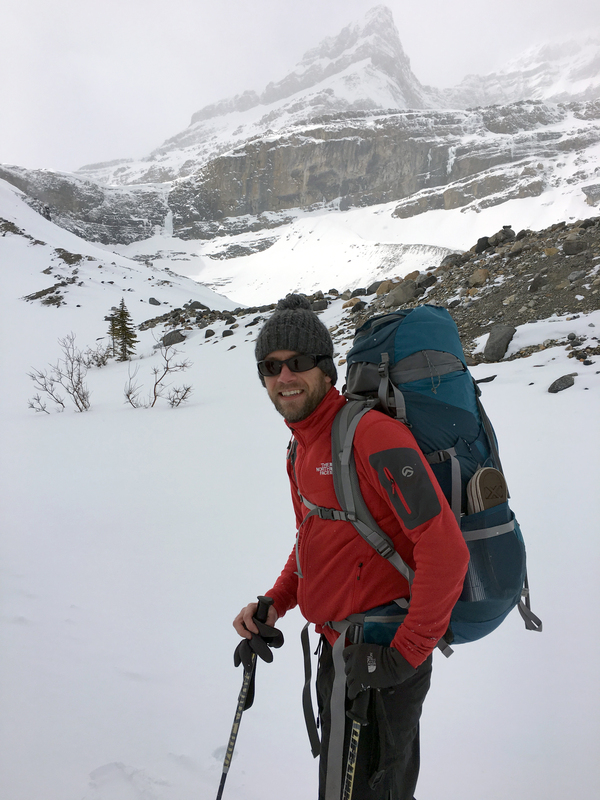 Overall, a week in the Wapta Icefields was an incredible experience. The scenery and vast terrain were beyond anything I was expecting, the seemingly endless supply of good quality skiing terrain and decent huts providing ample bases for exploring it. The champagne powder that had eluded me previously was as good as hyped even though it hadn’t snowed for several days before we arrived. 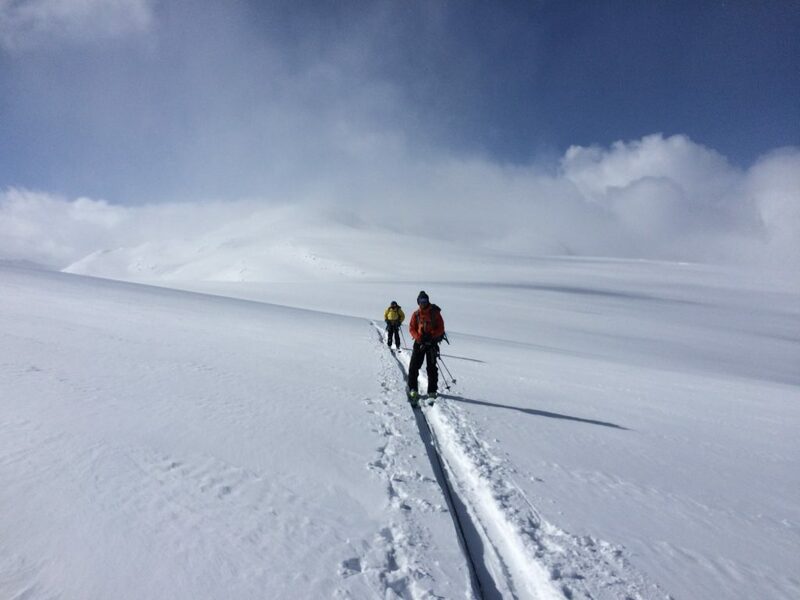 The continental climate with cold temperatures here ensures that the powder stays fresh for some time above 2000m and the lack of tourists means you’re very rarely skiing in other peoples tracks. It’s certainly somewhere I wouldn’t hesitate in coming back to – hopefully to complete the Wappta Traverse next time. The only downside we both felt was the guide, annoying to the point we were glad to be leaving his company after 6 days. His peculiarities and patronising comments were a constant source of irritation. Having said that, his teachings were definitely useful and we both felt we learnt some on route navigation and glacier travel. 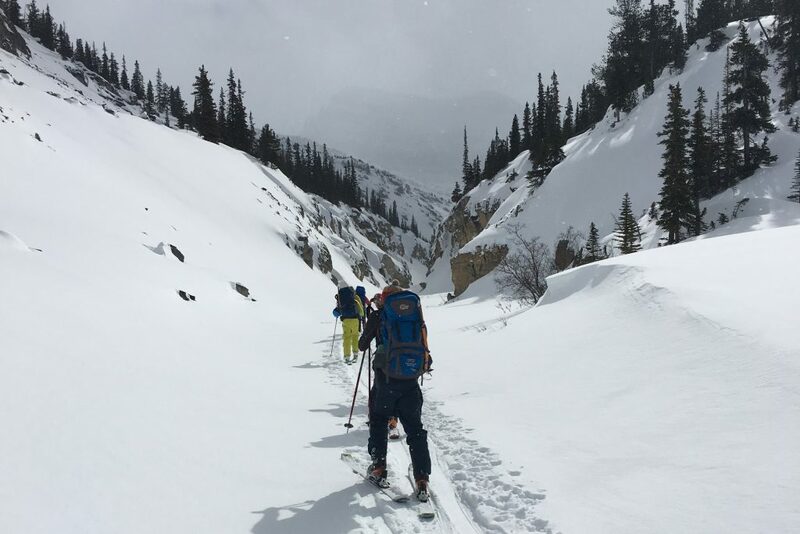 The trip was well organised by Yamnuska, aside from the American who clearly didn’t have the relevant experience to be tackling an intro to ski mountaineering course. This entry was posted in Skiing, Travel. Bookmark the permalink.